This has been discussed with leadership and approved as an interim step moving towards our ideal solution. The ideal solution will take much longer and will be described in future proposal task. This gets us by for the foreseeable future. We want to combine package documentation into the Docusaurus documentation. 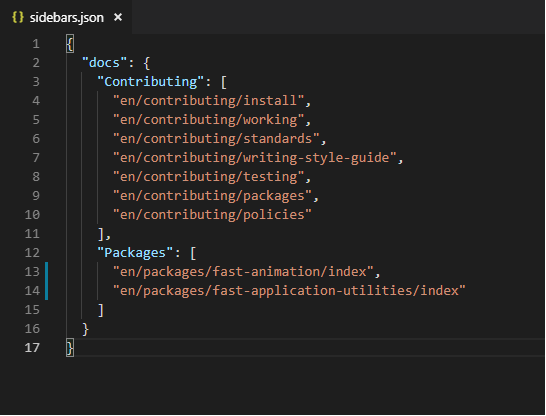 Write a package script that will execute a new process to copy each package readme.md into ./docs/en/packages/[package-name]/readme.md where Docusaurus expects markdown content files. This image shows how things come together in Docusaurus land. This should all be scripted with exception to the Docusaurus sidebars.json file. a. Conditionally create folder if nonexistent matching the package name. Add the Docusaurus header as shown in the image lines 1-4. This will need to be created in code. Id will always be index. Title should be the package name as indicated by the package folder name. First word "FAST" all caps. Other words should be readable without hyphens. Sidebar_label: Should be the name without hyphens and without FAST. Compile Docusaurus and ensure that these files are compiled along with our other documentation markdown files along with the appropriate navigation being rendered to the page. npm run build to compile any structural changes. npm run start to run the website.